leave the 1st string alone (E). You can use the tab file's embedded audio playback to match up your strings by ear against mine. Roy: Lyle, will the 6th string sound real low? Teacher: Yes Roy, the 6th string is lower in pitch by two whole steps, from E to C.
Teacher: If you're tuned up correctly, your guitar should be in tune with mine. 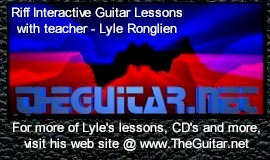 Play back the chords in the tab file to check your tuning with me. All 6 strings can be played straight across the neck with the slide to create the chords. Remember that the slide goes on TOP of the fret wire, not between them. Teacher: Just for fun I wrote an intro to the Lesson Sample. It didn't use the slide until the very last note of the riff. Teacher: You can loop the tab if you want. Later this riff will be used in a solo! Teacher: You can loop the tab file to practice the main riff with me. Teacher: Any questions so far? 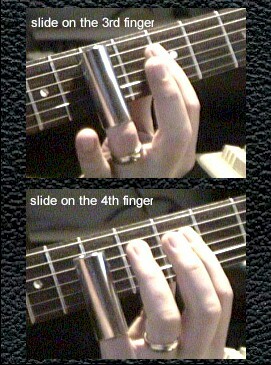 Rob: I use my slide on my fourth finger. Can I use first, second and third in the turnaround riff? Mathew: Is there a rule of thumb as to where a slide should go? Teacher: Most of the time the 3rd or 4th finger is used for wearing the slide. Teacher: Notice when the chords change to F and G the solo riffs move to those chord positions on the neck. This makes it easy and fun to play blues in open tunings. Teacher: That should give you all a bunch of cool riffs to work on!